In what had to be a tough admission for him to make, Chris Matthews, on Wednesday's Hardball, claimed the 2 to 1 positive rating for the tea party movement, in a new NBC News/Wall Street Journal poll, was a sign of "The power of Fox." CHRIS MATTHEWS: And what about the tea party movement? This is the shock-a-roo. They have a 2 to 1 positive rating but insider information from Chuck Todd explains why, perhaps. CHUCK TODD: Well look there's a couple of, couple of demographic-ing. You know we, we- among Fox News viewers the tea party movement is enormously popular - 75 percent of a positive feeling toward it. Just five percent among everybody else, non-Fox viewers, as far as how you get your information, the tea party movement actually has a slight net negative. Still overall, it gives you that positive 41 percent. MATTHEWS: Well that tells you the power of Fox, in a way, doesn't it? TODD: -as a populist, outside Washington. Because that's the other thing. MATTHEWS: So it's a horse in rabbit stew. An overwhelming love of these tea parties by one group of people offsets the metza-metza view from other people. MATTHEWS: Did you read the question though? It basically said, "Here's a group of conservatives who get together who are concerned about high taxes." Well what's wrong with that? MATTHEWS: It isn't a bunch of screaming, crazy people yelling, like you see at these parties. TODD: The fact is that issue is working. The fact is anti-Washington sentiment is growing. So which party is going to be the party of the populist. Okay? MATTHEWS OVER VIDEO OF PROTESTORS: Yeah they didn't show these pictures when they asked the question. A little later in the program the Politico's Jeanne Cummings also admitted to being "surprised" by the good showing in the NBC News poll by the tea party movement, and Matthews called their increasing popularity "disturbing." 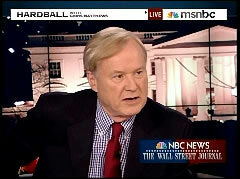 MATTHEWS: Up next those tea partiers are the big winners in the NBC News/Wall Street Journal poll. You may not like it, but they are. People seem to like these tea-bag meet-, these tea, shouldn't call them tea-bags meetings, these tea party meetings. How bad is it for the Democrats and the Republicans when the tea party people have higher approval ratings than either political party. The "Politics Fix" up next. It's kind of disturbing to hear this, but it's true, apparently. This is Hardball on MSNBC. MATTHEWS: Let me ask you Jeanne. What was your reaction when you saw the NBC News poll that came out this evening that shows, here they are, 35 percent have positive feelings about the Democratic Party, which is still a majority party in this country, 28 percent have positive feelings about the Republican Party the second party, 41 percent have positive feelings about the Tea Party! What do you make of that? MATTHEWS: A lot of Fox folks. A lot of Fox folks. MATTHEWS: A lot of Fox TV people, yeah. CUMMINGS: Absolutely. You got Republicans in there for sure. But I think it almost looks to me like a default vote. It's pretty clear if you go, I was recently at a focus group. There’s a palpable dissatisfaction with both political parties right now. So given a third option, perhaps any option, people, I think, probably went for that so they could record that dissatisfaction with both the Democrats and the Republicans.